Of the nine technicians on staff, four are master technicians. 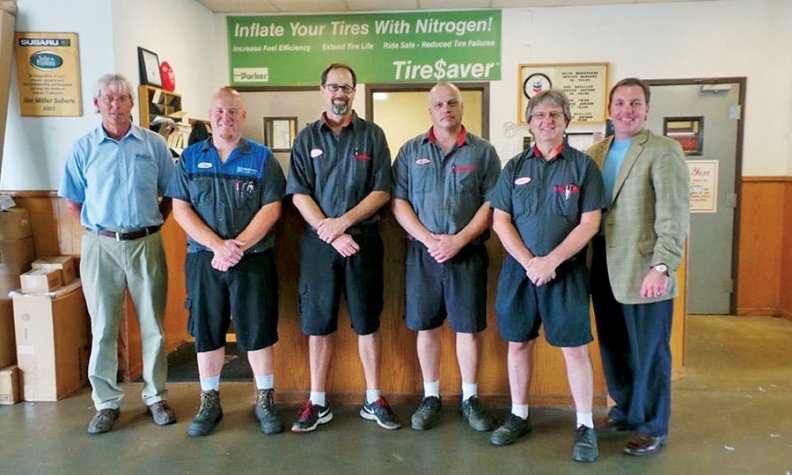 From left: Keith Boesenberg, service manager; master techs Adam Herman, Scott Hansel, Scott Ward and Dave Brown; and Dave Wright, owner. * Cool perk: Annual all-employee, all-expenses-paid golf outing and steak dinner. Since this is the only time many of the employees golf, they are divided into teams mixing departments so everyone plays with employees from a different department. * Wright on recruiting: "We have started recruiting high school students as paid interns. We let them work hours that are best for them and match them to an area of interest they have. "For college grads, we have found success extending their training periods and extending salary guarantees for those in commission positions. We break our training down to longer classroom instruction, starting with the basics and ensuring they have mastered a skill before moving on. When they have completed the classroom training, we leave them on salary while they start their new position. We also continue daily training while they are performing their job duties in front of customers. We give them goals and the choice to come off salary and earn bonus pay." * Sales Manager Matt Hastings on showing employees that they are valued: "The owner, Dave Wright, makes employees feel like family. We genuinely feel he really cares about every employee. If someone needs help, he makes sure that employee is taken care of. "The owner and managers meet once a week to problem-solve or review ideas to make the dealership better, and if an employee has a good idea, we know it will be implemented. "If a department breaks a record or an employee achieves an honor, like master tech, the owner always caters in food for the whole dealership to celebrate, not just one department. Every Saturday, he buys lunch for all the employees, and every month, we have a birthday cake to celebrate all the birthdays. "During the Christmas party, he hands out cash and prizes, usually based on years of service and not on performance. Prizes have included trips and rings for those who have 30-plus years of service, and everyone gets at least some kind of cash prize."